The Load-On-Demand feature of RadTreeView allows child nodes to be added on the fly as parent nodes are expanded. ServerSide: This setting triggers a post back to fire the NodeExpand event. See the Server-Side Load On Demand topic for an example of using this setting. ServerSideCallback: This value triggers an asynchronous callback that fires the NodeExpand event. See the Client-Side Load On Demand topic for an example of using this setting. WebService: This value causes the web service specified in the WebServiceSettings property to be called. The web service has a specific signature that returns an array of RadTreeNodeData types that automatically populate the child nodes of the clicked-on parent node. 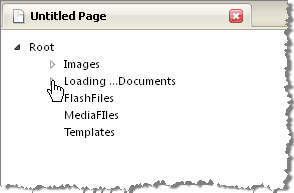 See the Web Service Load On Demand topic for an example of using this setting. ClientSide: This value signals that data has already been retrieved from the server. Once a parent node has all its children loaded you can set ExpandMode to ClientSide. For other properties that control load-on-demand appearance and behavior, see the Load On Demand Properties topic. For additional information on the pros and cons of the load on demand modes please check this blog post: Load On Demand Modes - why so many?